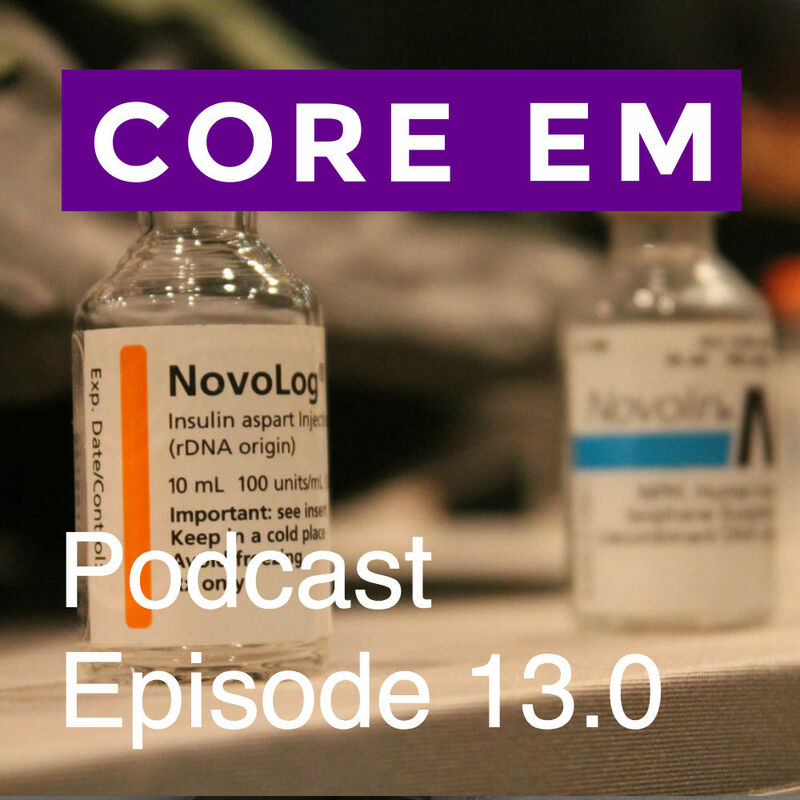 Lily Abrukin (Chief Resident) and Swami discuss the care of a critically ill patient with DKA. Lactated Ringers has 4meq/L potassium and 28meq/L lactate as base. A better fluid choice in this patient may have been 1/2 normal saline with 50-75meq/L sodium bicarb added. It’s unclear if bicarb would have a benefit. As with much in DKA, there’s no real data. However, physiologically, it’s unlikely to make any significant difference. For NaBicarb to work, have to blow off CO2. These patients are already maximally blowing off CO2. Instead of targeting a specific pH, I would aim at overall patient improvement. You can consider dialysis in severe acidosis, though. Just a comment about the cerebral edema issue. I also practice EM in the UK and the brits have protocols for pretty much everything. In pediatric cases of DKA, you are not allowed to do anything w/o the OK of the pediatrician. (I know… don’t get me started on that). Their DKA protocol is so conservative that IVF are seen like a potential iatrogenic therapy in kids, because of fears of causing cerebral edema. The kid could be in shock, dry as bone and they will only give a 10 cc/kg bolus! In 2013 in the journal of Pediatrics (http://pediatrics.aappublications.org/content/131/1/e73) there is a RCT of 18 kids (I know is a low number, but is randomized data) which showed no difference with the rapid fluid replacement compared with the slow approach, and more importantly, MRI findings were worse at the beginning of treatment and consistent with vasogenic edema (not osmotic) compared with post-therapy in all kids. This strongly suggests that kids that complicate with cerebral edema, already arrived with cerebral edema. Now a quote from the NEJM (http://www.nejm.org/doi/full/10.1056/NEJM200101253440404) “Although osmotic factors and other mechanisms may play a part in the development of cerebral edema, our data lend support to the hypothesis that cerebral edema in children with diabetic ketoacidosis is related to brain ischemia. Both hypocapnia, which causes cerebral vasoconstriction, and extreme dehydration would be expected to decrease perfusion of the brain. In addition, bicarbonate therapy causes central nervous system hypoxia in laboratory animals with diabetic ketoacidosis. Hyperglycemia superimposed on an ischemic insult increases the extent of neurologic damage, blood–brain barrier dysfunction, and edema formation. This interaction might help to explain the occurrence of neurologic damage in association with minor degrees of cerebral hypoperfusion. Blood–brain barrier dysfunction and vasogenic edema may occur several hours after an ischemic insult as a result of the release of vasoactive substances and mediators of inflammation. The occurrence of cerebral edema several hours after the initiation of therapy thus correlates well with the hypothesis that the basis of this complication is ischemia. Finally, the more frequent occurrence of cerebral edema in children than in adults may be explained in part by the fact that children’s brains have higher oxygen requirements than adults’ brains and are thus more susceptible to ischemia”. Pedi DKA in shock -> Treat shock ! Their brain needs perfusion. The osmotic diuresis alone causes severe hypovolemia, they are in a high adrenergic state causing more vasoconstriction, their brain is not perfusing and the longer they stay like that the worse they will be. Adan – I agree wholeheartedly. The idea of fluids causing cerebral edema is unfounded. Most important to me is to replenish intravascular volume and vigilantly look for and treat cerebral edema when it occurs.